We have a mantra where healthy meals are concerned: everything is better in a taco! Vegetables? Better in a taco. Beans? Better in a taco. Guacamole? Better in a taco. And Wild Alaska Pollock? Well, this one is reliably delicious no matter how you eat it, but it’s definitely next-level delicious in a taco. And the best part about fish tacos is that you have seemingly endless options in terms of ingredients, method of preparation, toppings, shells, you name it. You can mix and match your ingredients and seasoning based on your taste, or if we’re being practical, based on what you have availability in your kitchen. 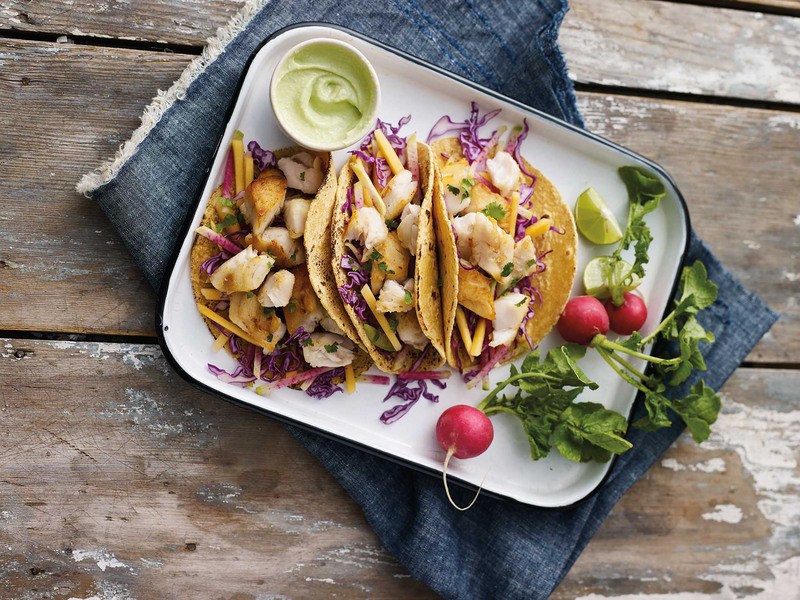 Wild Alaska Pollock makes a perfect taco star for a number of reasons. From a nutrition perspective, Wild Alaska Pollock is incredibly healthy. It is high in lean protein, low in fat, high in B vitamins and packed with omega-3 fatty acids. From a flavor and texture perspective, it is mild, tender and flakey. It is also one of the most versatile fish out there; you can broil it, sauté it, bake it, fry it…you can’t go wrong, which is why this fish is so easy to use and such a consistent crowd-pleaser for both chefs and foodies. And in terms of sustainability, this species is an all-star. This fish is naturally abundant in the North Pacific Ocean, specifically the icy waters of Alaskan. Whether you prefer crunchy, soft, neatly wrapped up or messy and deconstructed, there’s a taco shell for you. Hard shells add a level of crunch and another texture to your taco, but they also tend to be a lot harder to eat without getting taco filling on your lap. Soft shells come in a few varieties, from corn-based to flour-based, grain-free and gluten-free. You also can choose from different sizes of soft shells, from 8” to 12” and now a lot of store-bought brands even make taco bowls, which are essentially taco shells made to stay in the shape of a bowl rather than a wrap. Once you know your preference for your taco shell, you have to move on to the most important part of your taco — the filling. After all the real star of any fish taco is the fish you choose and the way you prepare it. With Wild Alaska Pollock, the possibilities are endless, because it happens to be firm enough to hold up nicely regardless of how it is prepared, but it is also moist, delicate and flakes to perfection, making it an excellent choice for tacos. You can make fried fish tacos using a simple coating made from flour, paprika, salt and pepper, or you could make beer battered fish tacos using Panko bread crumbs mixed with flour and cornstarch to create a fried fish taco that is extra crispy but still light. If you are looking for a slightly healthier recipe, then skip the frying and opt for a pan-seared, sautéed or baked fish. To bake Wild Alaska Pollock all you need is a marinade or seasoning of your choice, and then bake the filets at 400 degrees for about 10-15 minutes depending on the thickness of the fish cut. Obviously the thicker the fish the longer it will need to bake. And if your fish is not thawed before you bake it, the cooking time will be a few minutes longer. You can choose a chimichurri sauce or just season with salt, pepper, garlic, or opt for packaged taco seasoning. For sautéed fish tacos, all you need is oil, fish, taco seasoning and you’re set. Simply heat the oil in the pan, then cook your fish for about 3 minutes per side, adding the taco seasoning at the end and then cooking for 2 minutes more to infuse the flavors in the fish. Once you’ve picked your fish preparation method, your seasoning and your shell then the fun begins. Do you prefer your taco to be spicy or sweet? Mild or my-mouth-is-on-fire? Do you like a crunchy slaw or a refreshing salsa? Do you like the mix of sweet and salty or you prefer straight spicy? It’s really a matter of preference and balance. We love a simple cabbage slaw that is the perfect blend of crispy, creamy, salty, spicy and sweet. A mango salsa makes your fish tacos taste extra fresh and like summer on a plate. And of course, if a spicy mayo sauce is more your speed then it’s hard to beat a garlic lime crema. 4. Always Add Avocado and Cilantro! Seriously, if you eat fish tacos and you don’t add a generous serving of avocado did it even happen? And while some people despise cilantro (it’s a real thing, some people have a genetic condition that makes cilantro taste like soap), we find that it always takes your fish tacos to the next level.